I’ve been icnreasingly annoyed with Apple for the past two years. The recent boondoggle lawsuit has only furthered that annoyance. Today, the iPhone 5 is being announced, right this moment in fact. – VIP email, thank you…of course, Gmail allows you to create filters so you could do something fairly similar. – LTE, finally iPhone users can have 4G like everyone else…. – Panoramic photos, store card bank, and lots more apps that you’ve been using for several years – we cloned them. No, we don’t think that’s wrong. Only we’re allowed to sue over such stupid things. – NFC (Not For crApple) phones. – Complete redesign and rebuild of iTunes – ABOUT BLOODY TIME crAPPLE. Knowing you guys, you redid the entire music/store focus, and forgot to improve the app/synching/stability aspect. Remember PING, all the wasted time. – Clumsy Ninja, used to need a super-computer, now an iPod touch….sheesh, when did this need a super computer? 10 years ago…maybe? – Super-secret wrist strap button for your iPod touch. Just what EVERYONE wanted. Are we jumping the shark here Apple? I’m not sure if the iPhone5 would have been much different under Steven Jobs. But I am pretty after this, the iPhone 6 would be. – EAR PODS….Okay, I give credit where credit is due. These look innovative, stylish, odd, but a definite improvement. Look like they’d be more comfortable over a long period of time. And air flow design might help both in comfort and sound quality KUDOS apple. Allow me the ability to back-up and restore individual apps. And to transfer my iPhone syncing to another machine without erasing, and I might be content. So there we have it folks, about as I’ve predicted. Updated processor, LTE enabled, iPhone with a modernized plug. Now granted, iOS 6 has some interested and desirable features. But knowing #crApple, you’ll have to buy the iPhone 5 to use most of the features. Because things like “child mode” can’t be run on your older iPhone…ju$t $aying. I think I am starting to understand Apple’s lawsuit of Samsung. If this constitutes a “completely redesigned” phone, crApple must not be able to think outside of the flat rounded box. Where Apple should have gone. – iPod, wireless synching, wireless broadcast…any Apple Air speakers could be broadcast too. No more cables. Seriously, not impressed. And I am glad, because I really want to leave the iOS platform. And well, this feeble update, let’s call it iPhone4SII – we changed the exterior and called it a new phone. Seriously, I expect Apple’s stock to take a fair dive today. I think people wanted something a bit more advanturous for #5. Granted, the wide angle screen + mini connector + LTE alone will drive sales. But these SHOULD have been done back in the 4/4S era. 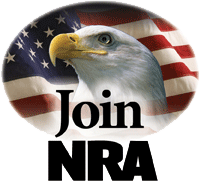 Mostly, I tend to keep this blog focused on target (firearms, 2nd Amendment Rights, and related topics). But every now and then I need to venture off. If you’re not much into the techie world, you may be completey unaware that a major patent lawsuit just decided against your favor. You see, Apple decided to file a lawsuit against Samsung and sought a $2 billion penalty and an injunction banning the sale of several of Samsung’s products. This patent covers scrolling to the end of a list and continuing to pull with your finger. Rather than stopping, the iPhone will often let the contents be dragged up higher revealing some null space; then upon release it will use an easing function to “bounce back” into place. Mind you, easing is a standard technique. It has been done in many Flash apps, granted mostly in mouse based scenarios. Samsung showed prior art as well. The real issue in this case, was not the “bounce back” but whether this had been done on a dedicated touchscreen device. Seriously, we need to quit making the mere “moving” of an idea to a new “medium” a patentable offense. Does driving on pavement versus a dirt road make for a new invention? An auction done online is NOT a new invention. It’s simply the use of a new medium for an old invention – this should NOT be patentable. So essentially, Apple won against Samsung on a patent for which clear prior art was presented. Merely by arguing minute differences. And largely, Apple is arguing that prior art didn’t display off-screen information. Mind you, Apple’s “off-screen” information consists of a blank screen space. Pretty damn weak if you ask me. This was the whole pinch/zoom issue. Granted, Samsung demonstrated some prior art. Including the fact that Adam Bogue demonstrated similar technology for Apple back in 2003. Mind you, we’re not even talking about much innovation to begin with. We’re not talking about the invention of zoom. But is the use of pinching worthy of invention status? Mind you we’ve had a lot of various ways to implement zooming. In fact, we’ve even utilizing pinching in many graphic applications. Honestly, this is IMHO Apple’s strongest case. But not something I think should be patent worthy. Yes, tap (double-tap) to zoom. So what’s at question here? One tap or two. I am dead serious, that is what this patent is all about. One tap or two. One tap is okay, but two is a no, no. We “own” that. This patent should have been invalidated. As I did this back in the 90’s. I’ve owned laptops with trackpads since 1994. And as early as the 2000’s I can recall using graphic editing software. And if I selected the zoom mode. Tapping would zoom me in. And depending on how your mouse was configured for actions, you could set it up to be double-click. So I don’t see how the mere fact that my touch pad and my screen are now combined together, makes a “behavior” I’ve used for years patentable as a new invention. This was the final patent. This wasn’t a patent on invention, but look and feel and interfaces. So let’s talk about some of the iPhone design attributes. The Samsung Galaxy S is probably the phone that most appears to be infringing, at least from an initial glance. (March 2010). 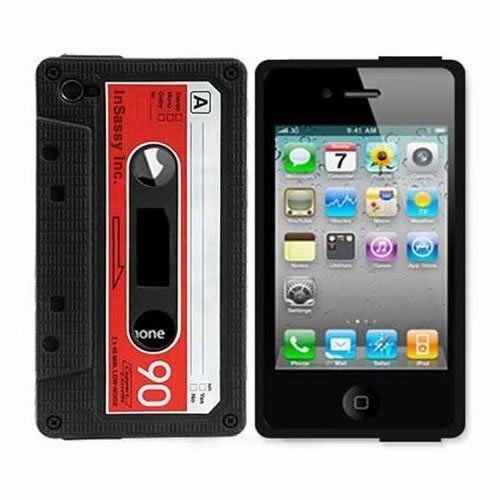 But this was also deemed to have infringed Apple’s design patents on the iPhone? And I am hard pressed to see any similarities in physical design. But the big question is how much is evolutionary? and how much of the iPhone is simply based upon other prior art? Wow, these Palm Tungsten units seem to meet many of the above criteria. The last of these was released in 2005. Sure looks like we can see where the iPhone interface came from. I bet if we changed the color of the Tungsten and it’s screen from silver and white background to all black. The similarities would be magnified. Granted they have more than one central button, but it’s quite clear the center button has greater prominence. Now looking at the Samsung phones, they have more than one central button. So that should be a non-issue, as many devices utilized multiple buttons but gave the center one strong prominence. 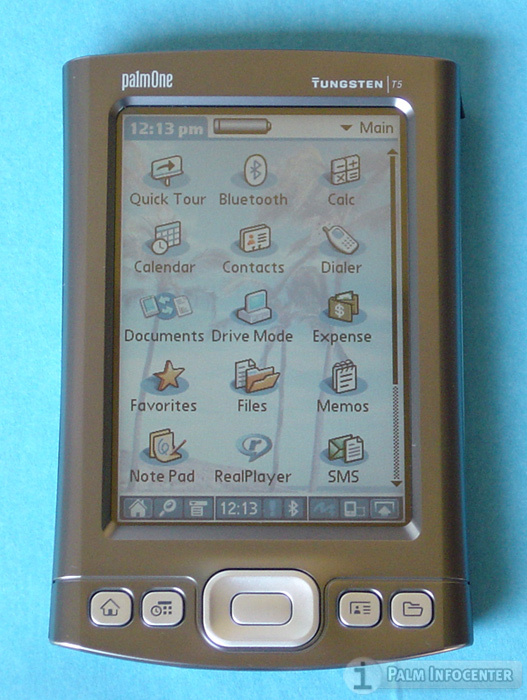 HTC 6700 – I owned one of these. So why do I reference it? Because it’s rounded edge, ear speaker placement, and button arrangement is very similar and relevant to the iPhone. Mind you, it has an antenna nub, but it was reduced from many prior designs. There was a clear desire to eradicate this as technology allowed, proving the iPhone was merely evolutionary in not having an antenna. Now let’s talk “style”….Prada, clearly this is a clone of the iPhone. Of all phones we’ve seen, this is the most alike in design. It was made by LG. 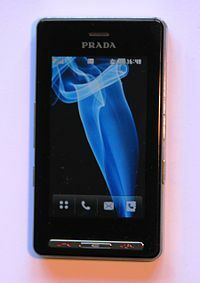 The only problem with the Prada phone is that it was designed and had many aspects shown nearly a yer before the iPhone. So what does this mean? It means, that the design of phones was already starting to trend toward this representation. Which namely, is a maximization of display screen real estate. Why is this? Because technology advances and LCD screens were coming down in price. And users want more screen. In fact, Samsung was working on the F700. Which was not allowed to be used in their defense. This phone was revealed 1 month after the iPhone. If you understand engineering, you’re going to be hard pressed to get even a prototype product from start to finish in one month’s time. 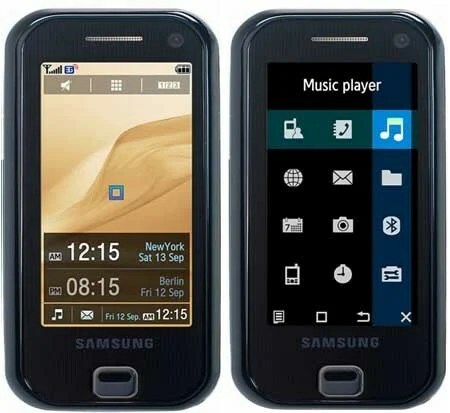 The evidence is that Samsung is probably telling the truth, and was working on the F700 before Apple released the iPhone. They may have tweaked some aspects to their favor. But the evidence across the board points to the basic style of the iPhone as being evolutionary and somewhere the PDA/phone industry was already headed too. Of all the phones, the LG Prada makes this very clear. It’s front appearance and software layout is extremely similar to that of the iPhone. Granted, that Apple did a superb implementation that was probably at least a year or two ahead of most of the competitors. But remember, Verizon typically delayed the release of phones on their network by 6 months to over a year. So many cell phone manufacturers were very tepid about major change. Fearing that they wouldn’t be allowed on the network. Few had the weight Apple had to bring to the bargaining table to be allowed as much control as they did. There is also some disturbing commentary here, where some of the jurors were looking to judge in Apple’s favor even on unregistered trade dress. Including icons, corners and rectangles. This is frightful, because to me it shows the jurors had no understanding of the concept of prior art. I wonder if the jurors asked for other phone samples? Really? 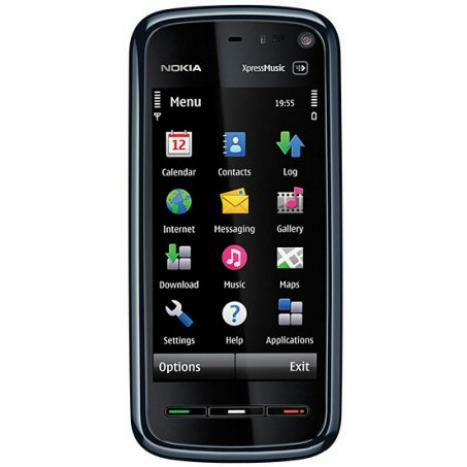 How about this Nokia phone? 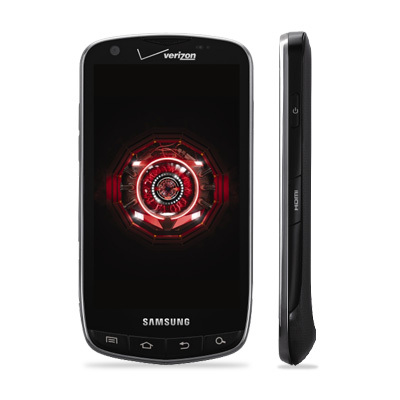 Sure seems to be as infringing as any of Samsung’s designs. If I were to express my feelings. I would say these jurors had next to zero understanding on these matters. Nor on the consequences of their decision. Just hoping that Congress implements some Patent reform soon. The reform I feel that is most needed, is restoring the patent system’s access to the common inventor. My solution for that, allow anyone to file a patent free of charge if they commit it to “public domain”. This would allow an individual with an idea, but without the $$$ and resources to produce the idea quickly (and compete against billion dollar multinational corps) to have their own use of the idea protected. This may seem crazy, but it’s not. I have ideas that I have had for years, and worked a bit toward. And now some of those ideas would likely fall afoul of patents owned by big mega corps. If I ever got my idea off the ground, I’d probably be sued for an idea I had long before. How sad is that? how does this promote innovation? It doesn’t…and needs to be fixed! Want one for your phone…. NOTE: If you’re wondering why these are so cheap. I thinkt here was a manufacturing error. My case arrived without a hole for the charger port. I simply took scissors and cut between the two speaker holes and the issue was resolved. So that’s the difference between $19.99 and $1.44 versions. They also offer free iPhone wallpaper. It will be interesting to see how it compares to the ShotTimer application that SureFire released for the iPhone earlier in the year. It’s a little application put out by a Firearms Lawyer in California. It features access to audio on DC vs Heller, Nordyke and other 2nd Amendment cases. News, calendar of upcoming gun shows (although it appears to be only California gun shows at the time). And also include links to a number of CA gun sites, & the lawyer who published the app – Jason Davis. The application is a bit CA specific. I’d love to see it expanded to include more from other states. Interesting article on the adoption and use of iPod Touch/iPhone for battlefield use in Iraq/Afghanistan. As of today you’ll notice a new iPhone icon in the right side panel. This will bring you to an iPhone edition of the N.U.G.U.N. Blog – it’s not fancy. It’s a reduced media version. But it’s formatted nicely for the iPhone and quite speedy – courtesy of Intersquash. There is another alternative if you can use WordPress plug-ins called WPTouch, but not sure if I can do that with the hosted version of WordPress. PS – If anyone figures out how to implement the “WPTouch” version on a hosted wordpress.com blog. Please let me know – thanks! When taking the NRA Basic Pistol and Home Defense courses, my instructor brought in a strange gadget which was designed to measure and record your shots fired, splits in time, etc. He explained it’s usefulness as a training tool. I express interest as a developer and an iPhone user about the prospect of just such an app for the iPhone. Well courtesy of The Firearm Blog I’ve recently been made aware that Surefire has released a Shot Timer application for the iPhone. 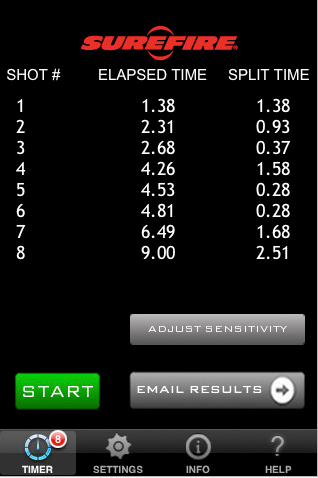 Best of all Surefire’s “ShotTimer” application is FREE!! !